Two love stories separated by 12,000 years. They take place on common ground — what is now the state of Georgia. There’s a paranormal element, but the stories are grounded in conflicts common to their eras. What lies in store for these two love stories across the 12,000-year gap? Josh Langston, author of ‘The 12,000-Year-Old Whisper’ has kindly dedicated a little time to guide us through the whispers of these romances through the ages. Josh, what inspired you to explore these two unique stories in this book? Where did it all start? The idea grew from a discussion with a retired professor of anthropology who was kind enough to steer me away from misconceptions and into valid questions about a culture we know precious little about: Paleoindians. I’ve never really considered the Paleoindians before, but now that I’ve heard about them I’m intrigued. How much did you know about them? I’m not exactly an expert on the paleo era in Georgia, but I’m getting close! Awesome! One day you’ll have to give us all a detailed lesson about this culture! But before that, let’s get back to this book. As you don’t have direct experience in the paleo era, it might have been tricky to inspire your writing through your own life. Did you find that you added touches of your own life to the story? Indeed. I’ve been teaching writing classes in an organization dedicated to enhancing the lives of those 55-and-over. One of the two romances features a pair of such lovers. That’s a really interesting way to layer in little bits of your life. Love that idea. So that’s how two of the characters came to life. How did the rest of the cast develop around them? Quickly! Once I had the two Paleoindian characters charted, the rest of the story just rolled. I found it exciting to play games with the “good” and “bad” that most people think of. I think that’s what makes the story rewarding. As you were playing games around these ideas of good and bad, did you find a central idea that you wanted to share became prominent? Yes, no one should be overlooked because of their size or disability. Given the right circumstances, *anyone* can be a hero. Does crafting circumstances where anyone can be a hero energise you? Or does it get a bit overwhelming? Both. But I also teach, edit, and publish other authors. Wow, with so many time being spent with other authors, it must be challenging at times to be focused on your own work. Which of your own projects is currently taking up your mental bandwidth? I’m working on a sequel to a paranormal romance set in Georgia during WWII. Another exciting adventure! I’m curious to find out about how you get into the mindset of each of these adventures. What do you like to keep at the top of your mind so you really get into the flow of the project? I focus on the story–the players and the conflict. Without conflict, there is no story. Well, at least not a very interesting story! As you’ve built more and more conflict over time, do you feel that you’ve seen an improvement in your writing skills? I would hope so! After writing a dozen novels, three textbooks, and a handful of short story collections, I’m quite confident in my author voice. Has this confidence translated into the creation of an author brand that you’re also confident about sharing with readers? Absolutely. I focus on action/adventure stories in a variety of genres. But the emphasis is always on interesting material, historical perspectives, and above all else humor. Oh, I love humour too! I didn’t have too many funny questions today to get us laughing, but let’s give the funniest one I have on hand today a crack and see how it goes. What is your favourite word? *Laughs* You know that’s not funny at all, but it is an awesome word, just like the awesome writer who suggested it! Josh, thanks for introducing many of us to the world of Paleoindians, and I’m sure that our introduction to this world will spark the imagination of many a reader! Excited to read the book we discussed today? Find it here on Amazon: ‘The 12,000-Year-Old Whisper ( ASIN: B011EY4TY8 )‘. 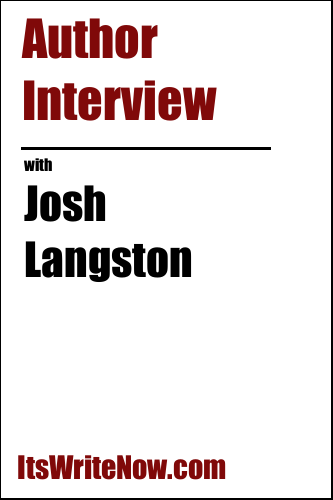 Want to find out more about Josh Langston? Connect here!